All you need to control your DS console. Compatible with DSLite, DSi and DSi XL. 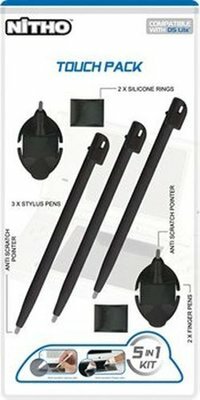 The pack contains: 3 multi standards (DS Lite, DSi, DSi XL) Stylus pens with anti scratch pointers - 2 Finger pens with anti scratch pointer and two sets of two silicone adapters.